The Ninnolo Gelateria is a lovely little place which serves good double espresso and has a decent ice cream selection. 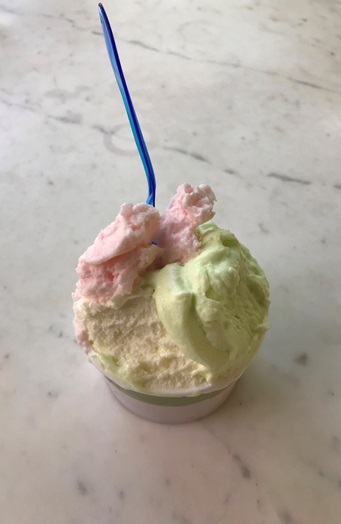 I went for three flavors (EUR 4.80): Mella Verde (which was somewhat more pistachio than apple), Rose (which did have a rose flavor) and Mastika (which had a Mastika flavor). 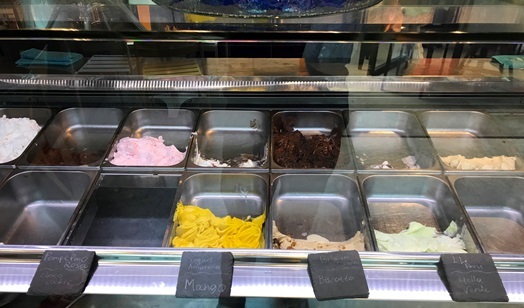 While the colors of the ice cream looked quite artificial, it was actually quite tasty and the portion was rather generous. However, it seems at this time of the year you wouldn’t have too many people trying to get some ice cream as the selection is half empty. The service is friendly and the atmosphere is hip yet lovely. So, if you are potentially enjoying your souvlaki at O Mythos, the Ninnolo is a great place to have your after lunch break with a good coffee and a decent ice cream.